STD Cooling: Raw Water (Open) Cooling System – Raw Water (River, Lake, Sea) Water runs through Cylinder Block. To fit GM based Mercruiser engines with 140oF or 143oF thermostats & standard cooling. Popular models include 4.3L, 4.3LX, 5.0L, 5.7LX, 350 Mag. 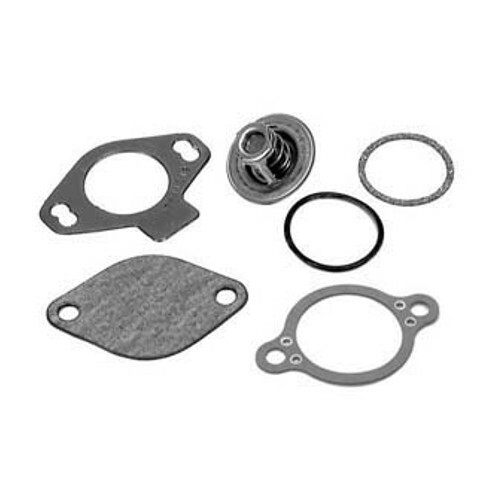 Supplied as a kit including 140oF Thermostat, O-Ring and Gaskets. Kit is to cover all later GM based applications with standard cooling and require 140oF Thermostat, and therefore may contain gaskets and seals which are not used for your particular engine.